It is common knowledge that when the student is ready the teacher will appear. Mine arrived in the form of a slight, English woman living in the Southern Spain where I worked in my twenties as a Holiday Rep. I had been suffering from chronic pain in my lower back and after numerous attempts to relieve the aches through traditional massage, I was serendipitously introduced to this lady whom we shall call Jackie, through a mutual friend. Although I have always been a highly intuitive person, at that point of my life I was living a bit on the wild side so knew my lifestyle was contributing to the physical symptoms but had no idea how Reiki would transform my life for the better. Jackie met me in the car park outside of her Spanish apartment in Benalmadena to assess me before inviting me in to her private space to perform the healing ritual. I felt comfortable with her immediately. She gestured for me to remove my shoes, rings and silver necklace and offered me a comfortable position on her massage table which was dwarfing her cosy front room. Laying on my back and covered with a fleecy blanket scented with lavender, I was instructed to close my eyes and concentrate on my breath as Jackie gently placed her hands across my face. Much to my surprise, a vivid spectrum of colours swirled behind my eye lids as a heat emanated from her palms and within seconds I was asleep. The rest is history. Needless to say, when I woke up at the end of this very relaxing hour the waves of pain in my lumbar spine had dissipated and I was left feeling rejuvenated and at total peace. Fifteen years and three continents later, I now teach Usui Reiki in South Western Australia and despite occasional relapses, I am living mostly pain free and have unquestionably rediscovered my soul purpose. So what is Reiki? And how can it be used to transform your life for the better? Reiki is an ancient Japanese healing modality and quite simply means Universal Life Energy, Soul Energy or Aura. (Rei = Universal Life, Essence and Ki = Light, Energy, Vital Life Force). It was re-discovered by Dr Mikao Usui who adopted the five Reiki Principles from the Waka poetry of Japan’s Emperor, Meji (1818-1912). It is a method of accessing concentrated life force energy and projecting it onto another organism, whether that is human, animal, fish, bird, seed, plant or even water. This life force flows through all things, animating the body, restoring the emotions and calming the mind. Reiki encompasses all levels of existence and intelligently restores equilibrium. The recipient naturally absorbs the energy during a treatment and the Reiki healer becomes a channel through which this vital life force flows. It is a beautiful exchange of energy which leaves both parties feeling uplifted and restored. The Reiki healer also has the luxury of being able to work on his or her own body. Once attuned they have this sublime energy freely flowing through their hands until the day they die, even if it has not been activated for a long period of time. There are five Reiki Principles which are recognised as a method of inviting happiness and as a technique to activate wellbeing. They can be used as a mantra twice a day as a reminder of the simplicity of life. It is interesting to observe that each of the principles starts with ‘Just for today.” This echoes the popular modern practice of mindfulness. Time is merely a psychic experience manifested by man. It is an illusion conceived by the human mind to structure events into 3D. As we know from Mindfulness and the teachings of Eckhart Tolle in his best seller “The Power Of Now”, the only time that actually exists is the present moment. 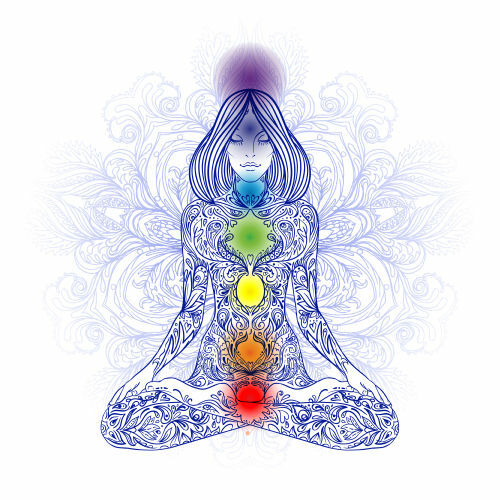 The life force flows within the physical body through channels and spinning vortices called Chakras and Meridians. It circulates around the body in an energy field called the Aura. The organs and the cells of the body are replenished by this universal life force energy but when this is disturbed the functioning of the physical body can deplete quickly and we fall ill. This life force correlates to our thoughts and feelings. If we develop negative beliefs over a long period of time, they get caught up in our outer causal bodies and can seriously weaken the functioning of our vital organs. Reiki is intelligent. It streams through weakened areas of our subtle body and charges them with positive energy which boosts the vibrations of the energy field. This cleanses the aura of negative thoughts and feelings whilst balancing the energy pathways so the life force can flow at the optimum level. The brain waves of the patient and practitioner harmonise and integrate during a Reiki treatment in the alpha state. This pulsates in alliance with the universal magnetic field which amplifies the bio-magnetic field of the healers’ hands by over one thousand times. This connection enables the practitioner to utilise the universal energy field and it is attracted to where the body requires it the most. The practitioners’ thoughts can not control the flow of energy as it has far greater wisdom and so fortunately it can never be misapplied. It is important to remember that the practitioner is merely a catalyst for the Reiki to flow and perform the healing. It can be used in combination with orthodox medical care and will accelerate healing. To get started, check out my post on creating your own treatment room. Till then, drop a note below and share with the community where you are on your healing journey!